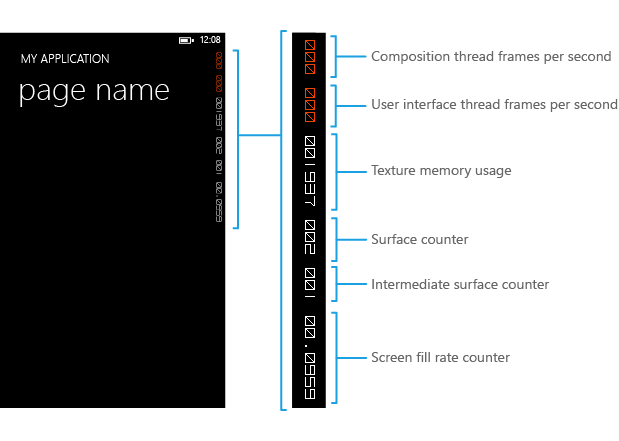 Ever find the frame rate counters and other debug information on the Windows Phone emulator more annoying than useful? It always appears there, whether in debug mode or release mode. What if you want to get a clean screenshot without having to edit the image later? The red and white performance information on the side of the emulator screen is a nice feature, but I haven't needed to use it much in my recent apps. It's possible. And, you only have to change one word. 2. Find the line that says `Application.Current.Host.Settings.EnableFrameRateCounter = true;`. 3. Change `true` to `false`. Now, you can get the full/real experience that end users would get when using your app, emulator style. Feel free to share this with other WP devs that you know. By default, the emulator has debug information on it.